The US Environmental Protection Authority (EPA) has restrictions on "Particulate Matter". scientifically unsupported notion that the fine particles of soot emitted by smokestacks and tailpipes are lethal. The EPA claims that such particles kill hundreds of thousands of Americans annually. But when the agency ran its claims past CASAC in 1996, the board concluded that the scientific evidence did not support the agency’s regulatory conclusion. Ignoring the panel’s advice, the EPA’s leadership chose to regulate fine particles anyway, and resolved to figure out a way to avoid future troublesome opposition from CASAC. Is it true that the EPA's restrictions on particulate matter are not supported by evidence - even today - that particulate matter kills many thousands of Americans per year? It is justified with (recent) evidence. Inhalation of PM2.5 – PM10 is associated with elevated risk of adverse pregnancy outcomes, such as low birth weight. Sapkota, Amir; Chelikowsky, Adam P.; Nachman, Keeve E.; Cohen, Aaron J.; Ritz, Beate (2012-12-01). 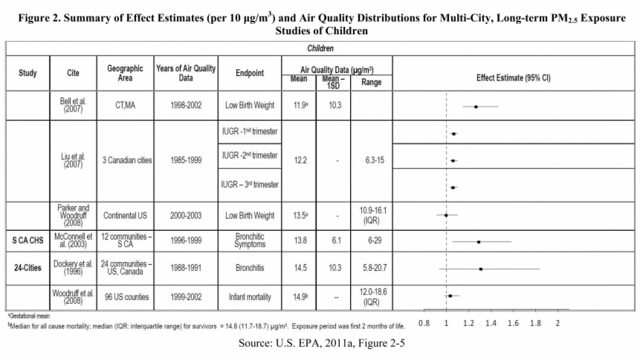 "Exposure to particulate matter and adverse birth outcomes: a comprehensive review and meta-analysis". Air Quality, Atmosphere & Health. 5 (4): 369–381. ISSN 1873-9318. doi:10.1007/s11869-010-0106-3. Increased levels of fine particles in the air as a result of anthropogenic particulate air pollution "is consistently and independently related to the most serious effects, including lung cancer and other cardiopulmonary mortality." "[...] fine particulate air pollution (PM(2.5)), causes about 3% of mortality from cardiopulmonary disease, about 5% of mortality from cancer of the trachea, bronchus, and lung, and about 1% of mortality from acute respiratory infections in children under 5 years, worldwide." Ole Raaschou-Nielsen; et al. (July 10, 2013). "Air pollution and lung cancer incidence in 17 European cohorts: prospective analyses from the European Study of Cohorts for Air Pollution Effects (ESCAPE)". The Lancet Oncology. 14 (9): 813–22. PMID 23849838. doi:10.1016/S1470-2045(13)70279-1. Cohen, A. J.; Anderson, Ross H.; Ostro, B; Pandey, K. D.; Krzyzanowski, M; Künzli, N; Gutschmidt, K; Pope, A; Romieu, I; Samet, J. M.; Smith, K (2005). "The global burden of disease due to outdoor air pollution". J. Toxicol. Environ. Health Part A. 68 (13–14): 1301–7. PMID 16024504. doi:10.1080/15287390590936166. [...] PM2.5 leads to high plaque deposits in arteries, causing vascular inflammation and atherosclerosis – a hardening of the arteries that reduces elasticity, which can lead to heart attacks and other cardiovascular problems. Pope, C Arden; et al. (2002). "Cancer, cardiopulmonary mortality, and long-term exposure to fine particulate air pollution". J. Amer. Med. Assoc. 287 (9): 1132–1141. PMC 4037163 Freely accessible. PMID 11879110. doi:10.1001/jama.287.9.1132. An increase in estimated annual exposure to PM 2.5 of just 5 µg/m3 was linked with a 13% increased risk of heart attacks. Cesaroni G, Forastiere F, Stafoggia M,; Stafoggia; Andersen; Badaloni; Beelen; Caracciolo; De Faire; Erbel; Eriksen; Fratiglioni; Galassi; Hampel; Heier; Hennig; Hilding; Hoffmann; Houthuijs; Jöckel; Korek; Lanki; Leander; Magnusson; Migliore; Ostenson; Overvad; Pedersen; j; Penell; et al. (2014). "Long term exposure to ambient air pollution and incidence of acute coronary events: prospective cohort study and meta-analysis in 11 European cohorts from the ESCAPE Project". BMJ (Clinical research ed.). 348: f7412. PMC 3898420 Freely accessible. PMID 24452269. doi:10.1136/bmj.f7412. Please check the full article for more studies and references. I am submitting a new answer because I believe there is a gap in understanding in how these regulations work. I will try to be brief, yet thorough. EPA regulates Particulate Matter, or PM, under the authority of the Clean Air Act Amendments (CAAA) of 1990. Specifically, there is a National Ambient Air Quality Standard, or NAAQS, which limits the PM in the ambient air below certain levels. In order to establish a new NAAQS, EPA must go through a rule making process. The end of this process is a publication in the Federal Register. The publication for the most recent update to the PM NAAQS can be found here. 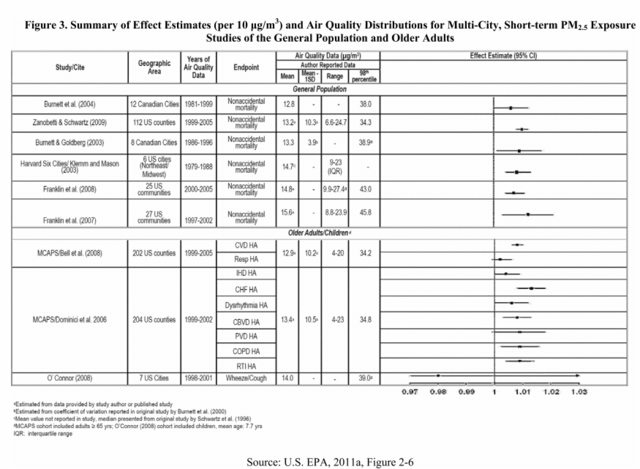 Within this document (specifically, starting on page 3103), EPA publishes an extensive review of the evidence for the negative health effects of the Criteria Air Pollutant that the NAAQS is limiting. I implore you to at least look at this, before believing someone who happened to opine in the Wall Street Journal. Our EPA is required to do almost everything in a very public and open way. All of the evidence that they consider justification for the PM limits is right here for anyone to read. "The CASAC recommended changes in the annual fine-particle standard because there is clear and convincing scientific evidence that significant adverse human-health effects occur in response to short-term and chronic particulate matter exposures at and below 15 μg/m3, the level of the current annual PM2.5 standard. The CASAC affirmed this recommended reduction in the annual fine-particle standard in our letter dated March 21, 2006 concerning the proposed rule for the PM NAAQS, in which 20 of the 22 members of the CASAC’s Particulate Matter Review Panel — including all seven members of the chartered (statutory) Committee — were in complete agreement. While there is uncertainty associated with the risk assessment for the PM2.5 standard, this very uncertainty suggests a need for a prudent approach to providing an adequate margin of safety. It is the CASAC’s consensus scientific opinion that the decision to retain without change the annual PM2.5 standard does not provide an “adequate margin of safety … requisite to protect the public health” (as required by the Clean Air Act), leaving parts of the population of this country at significant risk of adverse health effects from exposure to fine PM. Significantly, we wish to point out that the CASAC’s recommendations were consistent with the mainstream scientific advice that EPA received from virtually every major medical association and public health organization that provided their input to the Agency, including the American Medical Association, the American Thoracic Society, the American Lung Association, the American Academy of Pediatrics, the American College of Cardiology, the American Heart Association, the American Cancer Society, the American Public Health Association, and the National Association of Local Boards of Health. Indeed, to our knowledge there is no science, medical or public health group that disagrees with this very important aspect of the CASAC’s recommendations. 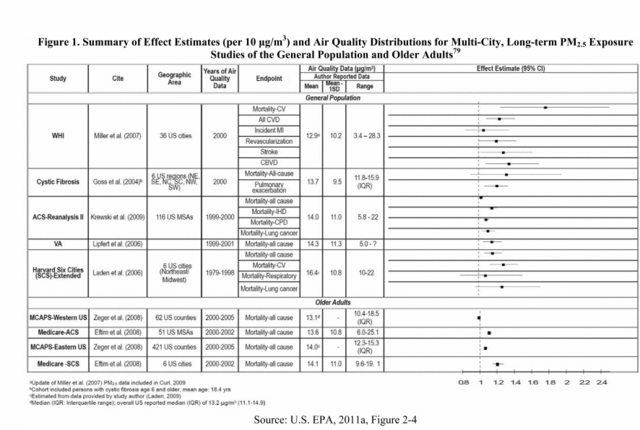 EPA’s recent “expert elicitation” study (Expanded Expert Judgment Assessment of the Concentration-Response Relationship Between PM2.5 Exposure and Mortality, September 21, 2006) only lends additional support to our conclusions concerning the adverse human health effects of PM2.5. This isn't completely true, there is evidence showing particulate matter is harmful for humans. The bulk of this evidence is in the form of Epidemiology studies, looking at human health statistics and comparing to their exposure to PM. The issues the author brings up is that he doesn't trust the EPA, but even if we ignore all the evidence they are responsible for we still find evidence by other organizations (and other countries) that PM may be harmful, which still justifies having it regulated. How strong or conclusive this evidence is and what a 'fair' level of PM that should be allowed in emissions is also debatable. But lucky for us this is set by government and we should stick to that, just like a speed limit. To show other organizations have a different view there is this study. To show why the evidence may not be considered strong you can compare it to this study on smoking, which is now widely accepted as bad for health and is also regulated to some fair level. Comparing the relative risk you can see it is much more clear that smoking is bad for your health. Another reason that the evidence might be thought of as weak is that the PM may be from a source that is also producing actual poisonous gasses that are completely responsible for the health effects. Comparing PM to smoking again, there is evidence (besides Epidemiology studies) to show smoking is bad for your health, cigarette smoke contains cancer causing compounds. The same is not proven for PM. Another point is that 90 % of PM is not man made, so even if evidence that PM alone is unhealthy (which we can't test without gassing people), regulating emissions may not be an effective way of mitigating those health issues. Not the answer you're looking for? Browse other questions tagged united-states environmental-health atmosphere . Is washing fruits/vegetables with water useful? Are cosmetic/pharmaceutical products without parabens healthier than counterparts with it? Is sitting straight up the healthiest way to sit?